The Poetry with Punch enrichment is a bite sized, taster version of the project. This day-long initiative allows up to 120 students - split in to four classes - to partake in 4 x 1 hour workshops. Each hour they shall carousel between poetry writing & performance, music producing, photography and dance choreography after a morning assembly and introduction. 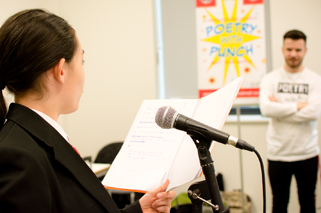 It is a hassle free, cost-effective method to acquire the Poetry with Punch experience. 1 booking guarantees a minimum of 4 artists for your school or organisation. Please note that Boxercise classes can also be incorporated upon request. 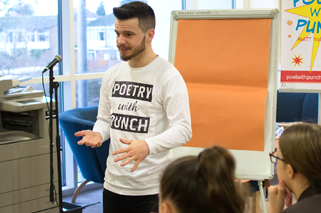 Poetry with Punch holiday clubs – also known as the School of Bard Knocks – is a week-long initiative that has been designed with the possibility of some of its students gaining a nationally recognised qualification through Arts Award. A class of 30 young people shall spend 4 full days in a fun environment, learning and creating work in preparation for a showcase event during day 5. Each performance shall demonstrate aspects of the 5 Poetry with Punch art forms. 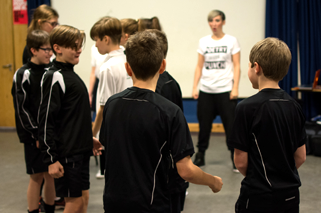 The School of Bard Knocks caters for all ages from Year 5 & above and is especially suitable for transitioning students that shall be joining your school in the new academic year. I booked Matt for 6 sessions to work with 22 under achieving boys to engage and inspire them to write. After the 6 week programme, 17 of the 22 boys were either hitting or surpassing their literacy targets. After working with Matt, my colleagues and I also noticed an improvement in their behaviour during and in between lessons.